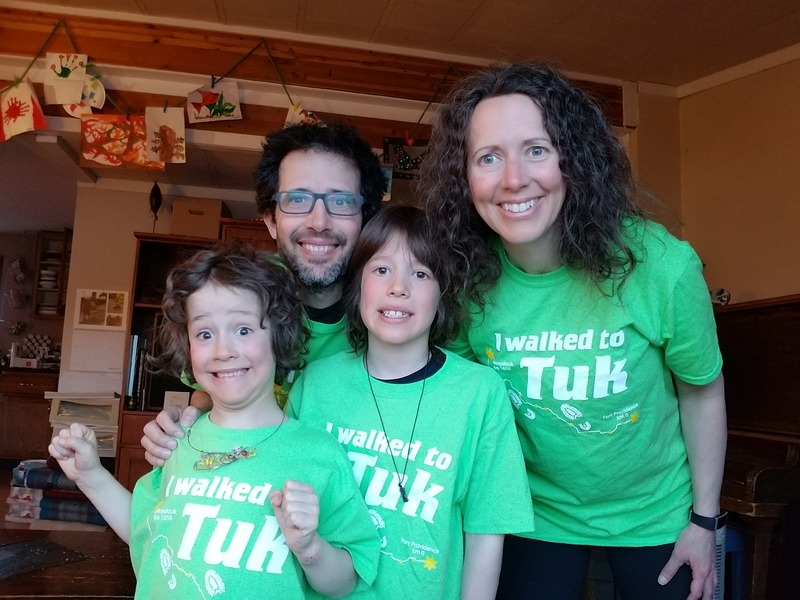 This year we decided to enter the Northwest Territories Recreation and Parks Association’s (NWTRPA) Walk to Tuk challenge as a family. With two adults and 2 kids (ages 6 and 8) we would need to each walk an average of 7km each day of the 2 months to complete the 1658 km journey (and get our t-shirts!). Less than a century ago walking that distance daily or more would have been normal but in our car-driving, desk-sitting, Netflix-watching Culture of Busy it has become an outlier. Most Walk to Tuk teams are either school classrooms or workplace teams with 10 or more team members to make up the mileage. NWTRPA puts the challenge on during January and February to encourage people to be more active during the coldest months of the year. Our usual getting-to-school morning routines were rush, rush, rush – hurrying the kids out the door and pushing them on a schedule that didn’t always line up with their biological rhythm. It also involved a lot of stress for everyone in the morning and not a lot of quality family time. While our goal for the challenge was to get more exercise, the half hour walking together each morning (instead of 5 minutes rushing in the car) afforded us the ability to slow down, enjoy time together, and have meaningful conversations. This is not to say that on some mornings we didn’t argue or that the kids didn’t doddle and certainly some mornings we might have been more hurried for appointments, but overall we all reflected that we enjoyed this relatively peaceful time together. We started playing the “noticing game” spontaneously started one morning by our youngest and continued every morning from then on. The kids would notice the ice developing on roof vents and the pattern it made. They would notice where the ravens were hanging out that morning compared to the previous morning. Each day we observed a particular roof with an overhang of snow about a foot below the edge and we would guess when it might fall. We all started noticing things and would state, “I notice that clump of birch trees”, or “I notice that there are 4 ravens today when there were 5 yesterday at this spot.” It became a way to be in the present moment with each other – our morning routine had never been so mindful and present before. January and February ended up being very cold months (as is normal for that time of year). As a result, the school the kids go to had more limited outdoor recess. With gym class only 3x/week and limited options for offering active time in lieu of recess, this meant that on many days the kids had very limited moderate to vigorous exercise at school and would have trouble meeting the 60 minutes/day minimum as recommended by the Canadian 24-hour Movement Guidelines. 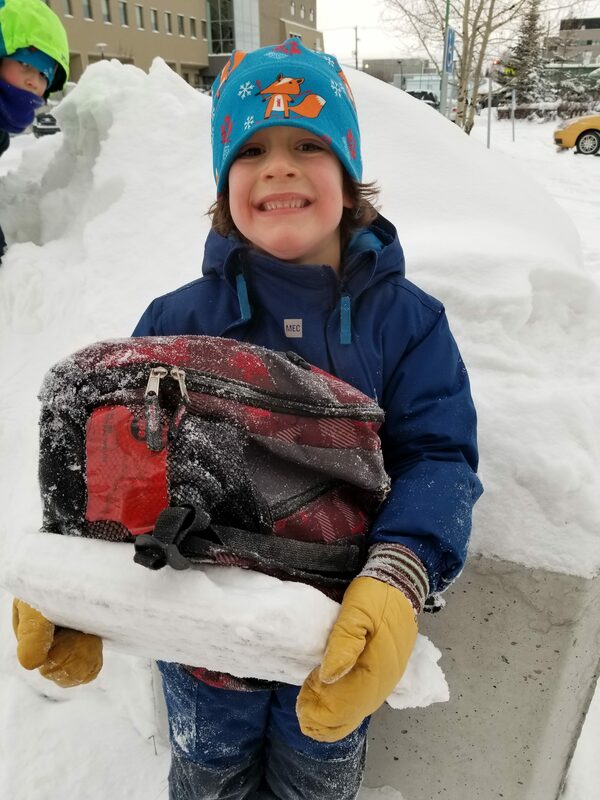 Our walks to (and often from) school each day helped our kids achieve or surpass the guidelines – healthy for both their bodies and their brains. The act of slowing down and connecting with each other, combined with more activity and fresh air also seemed to have a calming effect on us for the rest of the day. The kids seemed to be less argumentative and as parents we noticed ourselves feeling calmer overall and a deeper connection with the kids. In addition to the walk-to-school commitment, my partner Marc and I started walking more places too. We normally walk a lot – it is about a 10-minute walk from our home to downtown so we generally walk to work and for most downtown errands. Because we already walked to places within 15-20 minutes, increasing this would mean commitment. During Walk to Tuk I sometimes walked the kids to school and then walked to the Fieldhouse to run the track or to the pool for a swim and then walked back to the studio to meet my next client. I started walking to Latham Island instead of driving. Walking more definitely adds time to the commute, but the benefits of getting some extra movement in and some fresh air seemed to increase productivity for the remainder of the day. I don’t have metrics on that but I can report that I noticed improvements to both my mood and my efficiency at getting work done in the time made shorter by the lengthier commute. My sense is that slowing down for the walks may have given my mind more time to wander, coming up with creative ideas and solutions to challenges so that when it was time to focus on tasks again that focus was more directed. Outside of the walk-to-school times our kids enjoy many organized sports. Marc and I joke that although once upon a time we were somewhat athletic, lately our sport seems to be one we like to call “the logistics of getting two kids to their sporting activities on time.” It definitely gets the heart rate up, but maybe not for the duration that would be beneficial! So as part of our commitment, we each decided to run at the track 3x/week. In ancient history Marc had been a medium-distance runner, although various injuries have interfered every time he tries to get back into it. Since I spent much of last year in a training course studying injury prehab/rehab we now had a strength and training plan for him. As for my track runs, I had never liked running in the past (I prefer swimming) but have found a new love for running through a technique that focuses on keeping the heart rate lower and running slow (future blog post). The kids especially loved tracking our time every 2 weeks and watching us get closer to Tuk. In early February, about half way into the challenge, we noticed we were just under half way to Tuk so were making decent progress. And then…. I sprained my ankle (no idea how) and a week later Marc sprained his ankle at hockey. The walk-to-school mornings had been going so well and we didn’t want to give them up. After Marc sprained his ankle I decided I would continue walking the kids to school even if I limped and was slower than usual. I had to stop running but I decided to keep walking as much as my ankle would allow and I got back into swimming (which counts). Marc had to stop walking and running with his ankle and had a busy season at work. This meant that in the last 2 weeks of the challenge we had fallen behind and needed to log an average of 8 hours/day between us….and Marc and I were not fully functioning. Could we do it? Well you can see from the table above that we did (just barely) make it to Tuk (yay t-shirts!). Our kids attend an outdoor school one day per week (Bush Kids) instead of regular school….and they walk or move for at least half of those days. My ankle was much better in the last 10 days of the challenge so I started walking even more! The kids really wanted to get to Tuk and were upset that Marc and I with our injuries weren’t pulling our weight. This motivated them to walk more places and they even started adding additional active time after school to get to the daily target time (8 hrs combined) and make up for their lagging parents. Ok, so not the most verbally expressive kids….but they did have fun. And although we aren’t walking as much as during the challenge we have still continued walking to school. And our ankles have healed and we’re running again. We feel thankful for how the challenge motivated us to be more active and to get outside more during the coldest months of winter.